Ash Wednesday (March 6, 2019) begins the Lenten season in the Catholic and other Christian churches, lasting 40 weekdays (Mon-Sat) until Easter Sunday on April 21, 2019. The ashes placed on the forehead are a reminder that we are dust and unto dust we shall return. (Genesis 3:19). 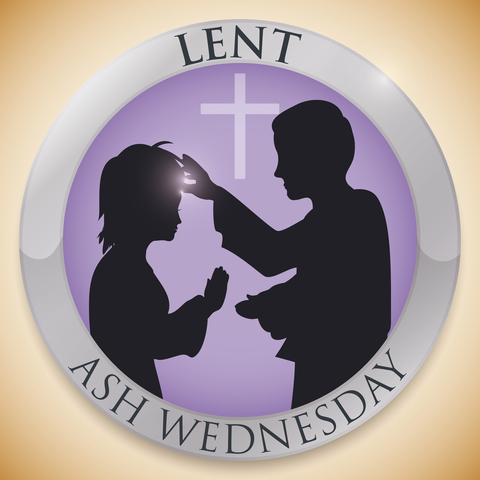 Lent is a time for focusing on the life and death of Jesus Christ through personal prayer, penance, repentance, selfless giving, and self-denial. Holy Week, the last week of Lent, commemorates Jesus' Last Supper with His Apostles on Holy Thursday, His Passion and death on Good Friday, and culminates with the celebration of Jesus' resurrection from the dead on Easter Sunday.